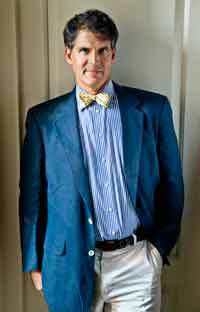 Neurosurgeon Dr. Eben Alexander III will give an audience insight into the closest thing to dying and the views from there when he appears as the keynote speaker at the 2013 Sun Valley Wellness Festival in May. The Sun Valley Wellness Institute announced this week that the New York Times No. 1 best-selling author will deliver the keynote presentation to kick off the festival, held over Memorial Day weekend, May 23-27, at the Sun Valley Resort. His presentation will be on Friday evening, May 24. Alexander has been an academic neurosurgeon for the past 25 years, including 15 years at the Brigham & Women’s Hospital in Boston, the Boston Children’s Hospital and Harvard Medical School. Over his academic career, he authored or co-authored more than 150 chapters and papers in peer-reviewed journals, and made more than 200 presentations at conferences and medical centers around the world. His book, “Proof of Heaven: A Neurosurgeon’s Journey into the Afterlife,” is a scientist’s case for the afterlife. According to the website of Eternea, a nonprofit organization of which Alexander was a co-founder, his educated perspective on life changed forever in the predawn hours of Nov. 10, 2008, when he was driven into a coma by a rare and mysterious bacterial meningitis-encephalitis of unknown cause. He spent a week in a coma on a ventilator, his prospects for survival diminishing rapidly. On the seventh day, to the surprise of everyone, he started to awaken. Memories of his life had been completely deleted inside of the coma, yet he awoke with memories of a fantastic odyssey deep into another realm more real than this earthly one. Alexander’s older son advised him to write down everything he could remember about his journey, before he read anything about near death experiences, physics or cosmology. Six weeks later, he completed his initial recording of his remarkable journey, a whopping 20,000 words. Then he started reading, and was astonished by the insights his journey brought to the world’s literature on near-death experiences, the afterlife and to all phenomena of extended consciousness. Alexander’s experience convinced him that we are conscious in spite of our brain, that, in fact, consciousness is at the root of all existence. According to the Eternea website, his story offers a crucial key to the understanding of reality and human consciousness. Alexander contends that while his body lay in coma, he journeyed beyond this world and encountered an angelic being who guided him into the deepest realms of superphysical existence. He related that there he met and spoke with the divine source of the universe itself. For more details, visit www.sunvalleywellness.org.